Echo Park saw the passing of an era this summer. For the first time in 92 years, a pair of cottages on Morton Avenue will no longer be in the possession of Gladys Rice and her extended family. 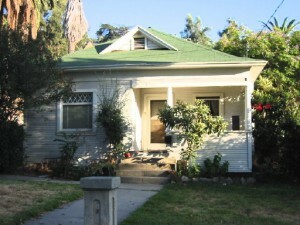 The little house at 1704 Morton Avenue is known to many in Echo Park as the house from “L.A. Confidential,” the setting for a creepy film scene where Russell Crowe finds rats and a dead body. But for Gladys and her family, the property has been home for generations. 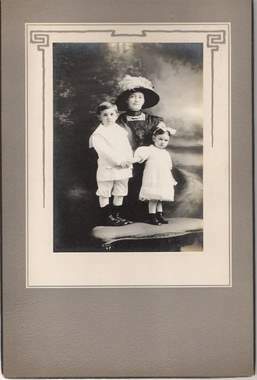 Almost a century ago, Karl and Johanna Korb, immigrants from Europe, moved to Los Angeles with their son Charles. In 1909, they had a daughter Ilett, who was born in the little clapboard house on Morton. Two years later a second daughter, Gladys, was born in the same house. As the family grew, they built a second house on their narrow lot. Karl died in the flu epidemic of 1918, leaving Johanna and her children, who attended eight grades of Logan Elementary School. In 1929, Gladys received her diploma from Belmont High School. Within a year, she was married. Gladys and her husband, Herb Rice, raised two children, Herb Jr. and Robert. Other family members also lived close to home: her mother and sister continued living on the property, while her brother ran a gas station on Sunset Boulevard at Alvarado Street (replaced in the 1960s by the Sunset Car Wash). Growing up, Robert took the streetcar to school, rode his bicycle throughout Elysian Park and caught polliwogs in the L.A. River. He got ice cream from Betty’s Ice Cream or went with his mother to the Jewish deli nearby (both are now the parking lot at Pioneer Market). Delivery men brought ice, bread and even fish to the Rice family home door (an Italian salesman went up the street yelling “FRESH FEESH!”). The Ramona Theater on Sunset Boulevard was plain, while the nearby Hollyway movie theater was considered much fancier. During high school, while working at his uncle’s gas station on Sunset, Robert made deposits at California Bank across the street. As the decades passed, family members passed away. But Robert always returned to visit Gladys, her sister and other surviving kin. Even after he entered the military, attended graduate school, and finally, took a teaching job at Christendom College in Virginia, Robert kept returning to Morton Avenue. “I had an attachment to this place,” he declared. This story is part of an extended oral history provided by Robert Rice and recorded this summer by the Echo Park Historical Society. To volunteer and record oral histories, call 323-860-8874.